There's been a lot written about Rachel North recently, but even so that's probably not enough. 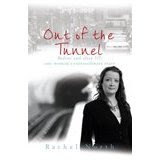 I had heard her story before I read her memoir, 'Out of the Tunnel' - how she was raped and left for dead by a stranger who knocked on her door one night, and, two years later, she was one of the passengers on a 7/7 tube, only surviving because of the crush of other passengers around. And if that wasn't enough, she's recently been stalked through her blog and then, just when her book was finally being published and everything was looking good, her mother had a stroke. It's the kind of series of events that makes you want to hear just how someone could survive all that intact. Well, this book makes it clear how they do - Rachel's not just a victim, and doesn't want to be treated as one. She certainly doesn't want to be cynically used as one by people with ulterior motives. Reading this book made me think how easy it is to pigeonhole other people - ah, poor girl - and how dangerous that can be. It's the way Rachel is prepared to speak out, and really search through to the truth, that cuts through all that. The experiences she's been through seem to have made her more determined to help other people cope with their lives, and not in a sickly sweet way either. This woman can get angry, which just makes her all the more likeable and impressive. She really does care - and so should we. I get the feeling that Rachel sees information now as the most valuable thing she can offer, and she's a powerhouse of facts and thoughts - just take a look at her blog. In fact, that's what I liked most about this book - how it felt like Rachel wanted to share these experiences with me as reader even though it wasn't going to be easy and the responsibility I then had to listen. I found myself cringing in lots of bits, but I couldn't stop reading. You never forget Rachel's a real person, not just a photograph or a news report, and that's the most valuable lesson for me from this book. The joy in just being ordinary - in being able to wish someone an 'ordinary year', in having someone look at your battered face and seeing, not that, but the ordinary, old non-perfect 'you' underneath the bruises. And there's plenty of joy in here too - in fact, that's what I was left with, a feeling of pride and inspiration. A great book. Thank you very much indeed for the review Sarah. I have linked you in a post and on the sidebar, and wanted to pop over to express my gratitude here as well. Thanks Rachel. I really did enjoy your book - hope it does well. You're a little bit early, love! Starting as you mean to go on..
Eek, I'm not going to survive the zombies!!! !